Why do coffee shop owners need to be active online? According to Hubspot, 72% of consumers who do a local search go on to visit a store within five miles, and the numbers for urban areas are even stronger. Hosting Facts tells us that in 2015, 64% of all in-store sales worldwide were influenced by the internet. According to a study from CrowdTwist, 62% of millennials are more loyal to brands that engage directly with customers on social media. We could go on for hours. But statistics aside, there are tons of people searching for coffee in their area online, and your presence on social media, and sites like Yelp and Foursquare, factors into their decision-making. Even if you don’t want to devote a ton of time into posting and building up your following (although we’d argue that you should), it’s worth it to at least go over your profiles every once in a while and make them look nice and up-to-date. Instagram is a photo-sharing platform that began to grow in popularity among millennials around the same time that corporations and their grandparents started using Facebook. Instagram’s focus is sharing beautiful pictures. Each post is a photo with a caption, and can’t include any links, so it’s important that you carefully cultivate your feed with great photography that puts your shop in a positive light. 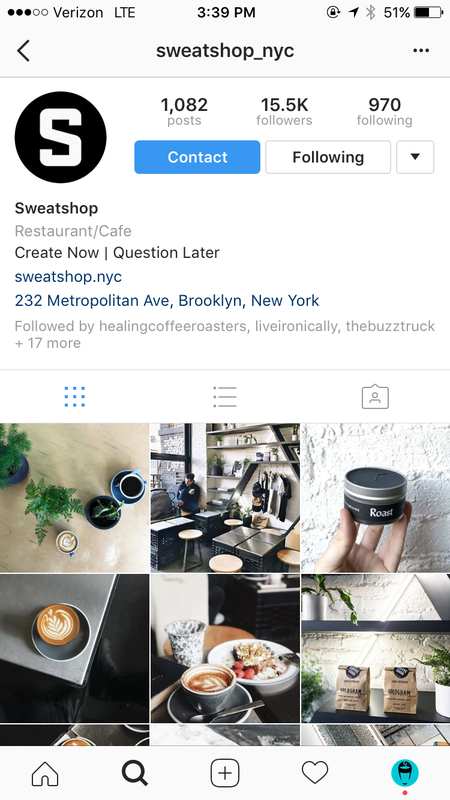 How can a coffee shop use Instagram? Instagram is a community where bloggers, content creators, and photographers come together to share their experiences and distribute content. A potential customer might take a look at your Instagram to decide whether or not your shop is worth visiting, and it can be a great place to reach out to regulars and new people alike. 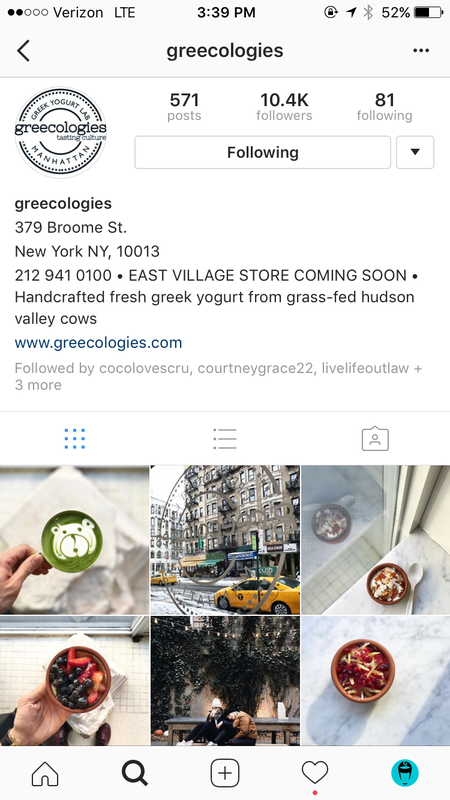 Both of these coffee shops post consistently, and repost photos taken by their customers, which connects them to their audience and humanizes their brands. Instagram has recently launched a major update: Instagram stories. This additional feature is basically the same as Snapchat (more details on Snapchat below), with posts that disappear after 24 hours and some fun features that let you draw on your photos. You can use this to give your followers a look behind the scenes, and show a less curated side of yourself. Snapchat is an app where users communicate with each other through pictures and videos, which last up to ten seconds and then either disappear forever, or can be added to what’s called a “Snapchat Story” – a series of photos and videos that is visible for 24 hours to all of the user’s followers. Snapchat has a ton of features that let users add text, drawings, and filters to their photos and videos, making it very fun and user-friendly. Since it’s restricted to a mobile app, and your snaps are only visible to your followers, Snapchat won’t contribute to your online presence in the traditional sense. That said, it’s still a great way to connect with your customers and keep your brand in their minds, and it’s a very active community – Snapchat users watch over two billion videos daily. How can a coffee shop use Snapchat? Snapchat offers custom on-demand geofilters, meaning you can create a photo filter that users can only see and use while in your shop. You can make a filter with your logo, which your customers will apply to photos of their coffee that they then send to their friends. It’s a fun and casual way to interact with your audience! Coffee shops are among the most common places for people to use Snapchat, and its users, who are predominantly millennials, get excited when they find a geofilter that’s relevant to them. 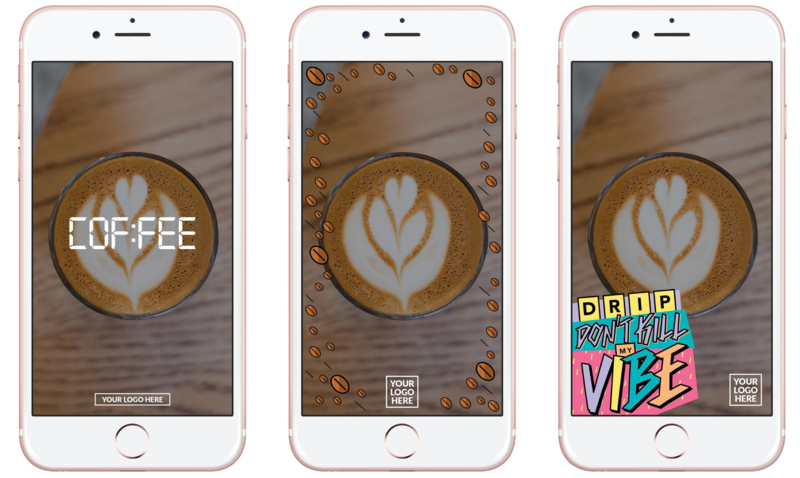 Luckily for you, CUPS makes it easier for coffee shop owners to have access to geofilters, with custom designs available for purchase – more details here. You can use your Snapchat Story to create a sort of “video diary” that excites your audience, and gives them a glimpse behind the scenes with raw, real-time content. All you have to do is take a series of photos and videos that have a theme or tell a story, and choose “My Story” when you send out each one. They’ll be visible for 24 hours. You should officially claim your business listing on Yelp, if you haven’t already done so. Keeping the information here up to date, and reading and responding to reviews, is crucial. We recommend setting a reminder for yourself once a month to go through and update all your info, and checking your reviews much more frequently. 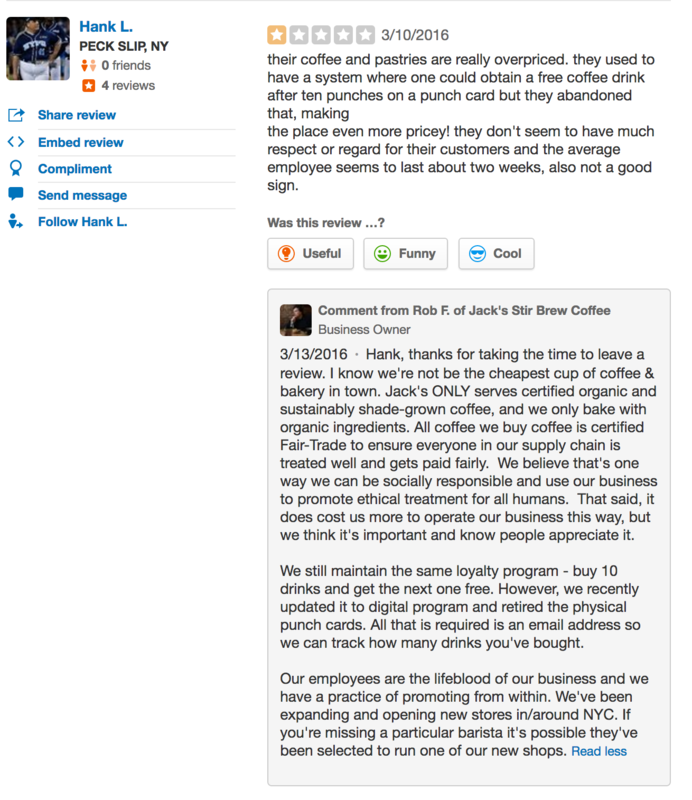 What should your coffee shop be doing on Yelp? No matter how good your product and customer service is, there will always be a handful of bad reviews. On Yelp, you can respond to this feedback, and it’s a good idea to do so. It is also important to be open to negative criticisms here, as Yelp reviews are one of the best insights into your customers’ minds that you have at your disposal. If there’s a common theme to the negative complaints that you see, consider taking action – this could mean there is a disconnect between what your customers want and what they are getting from you. Sometimes people are constructive and other times they’re jerks, but either way, criticism is an invaluable tool for a business owner. 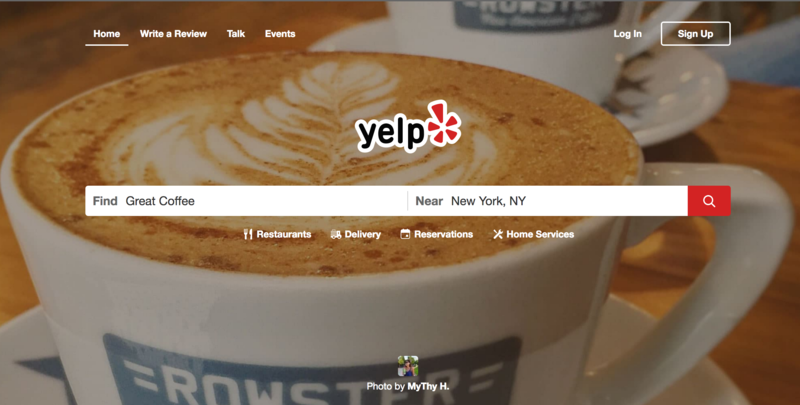 The From The Business section of Yelp is your chance to get personal and tell potential customers what makes your coffee shop so special – you’ll find it on the right side of the screen, below your business info. The sections are pretty self-explanatory – Specialties, History, Meet the Owner/Manager, and Recommendations. See Devocion and The Jolly Goat for good examples. Like Yelp, Foursquare is based on user ratings and reviews, but a little different – it’s sort of a discovery platform with elements of social media and a rewards program mixed in. Users can “check in” at different businesses in exchange for different rewards, as well as leave reviews and tips for other users, and they can see which of their friends would recommend a certain place. There are several benefits to claiming your business on Foursquare, including promoting special offers, and sending out updates to local users. 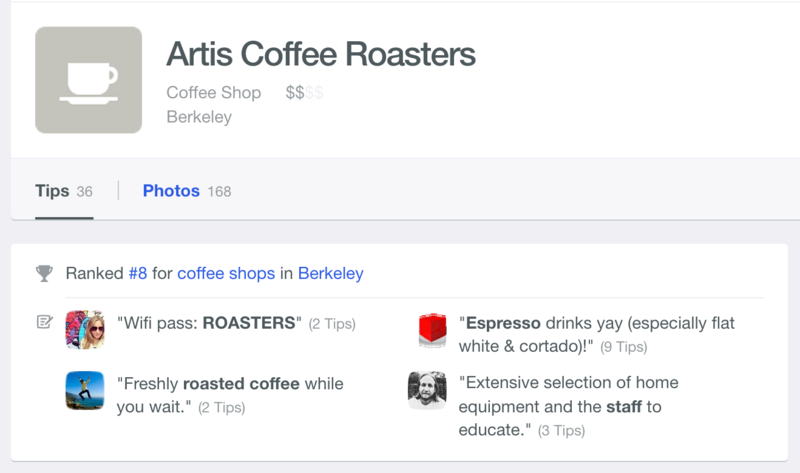 What should your coffee shop be doing on Foursquare? Once you claim your shop, their platform makes both of these very easy to do. You can also send updates, letting Foursquare users know about your happenings when they’re in your neighborhood. For example, you could use this to promote events and deals you have going on, or make announcements. We’ve really only scratched the surface, but hopefully this article has given you some easy, practical tips to implement on your social media and discovery profiles. If you’re looking for more, consider a CUPS Online Presence Revamp – we’ll give your profiles a nice makeover, and a copy of our in-depth guide to maintaining your online presence, which will give you all the tools you need for success.